2.4 miles north of Kilby's Station, on Route 626, we cross Route 657, Ashcake road, and proceed another 1.4 miles to Route 54, Thompson Street, where we turn left. Approximately a mile down Route 54, we turn right onto Route 669. After a short drive we arrive at a stop sign where Route 669 intersects with Route 667. Turning right onto Route 667, after .6 miles, we turn left onto Route 641. Following Route 641 to Route 1, we turn right onto Route 1. About .1 mile down Route 1 we turn left, back onto Route 641 (now called Elletts Crossing Road). We then follow Route 641 until it crosses under the R.F.& P railroad. After that, we turn left on Route 646, Hickory Hill Road, and park. On the left is Winston Farm. 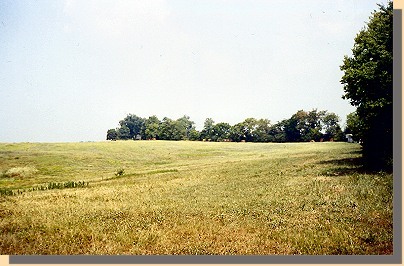 Stuart's men camped here on Winston farm the first night. Stuart and Rooney Lee spent the night up the road at Hickory Hill, the Wickham family estate. 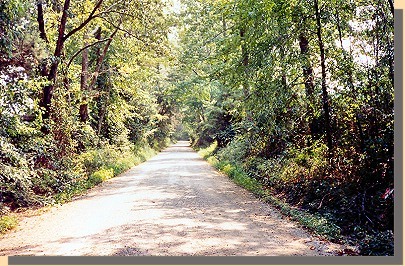 Hickory Hill Road, State Route 646. Back on Route 646, Hickory Hill Road, we cross over Interstate 95 and, after about three miles over a dirt and gravel road, we arrive at the Wickham (Hickory Hill) Driveway. This is a private driveway and should not be accessed without permission. 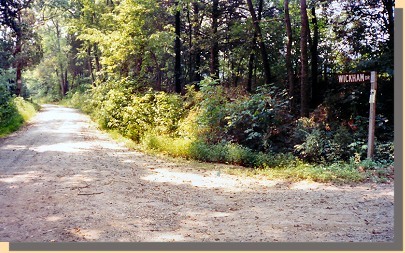 The Wickham Driveway. Photograph taken from Route 646. By daylight on June 13, 1862, Lee and Stuart were back on the Road. ... Our noiseless bivouac was broken early next morning, and without flag or bugle-sound we resumed our march, none but one knew whither. I, however, immediately took occasion to make known my instructions and plans confidentially to the regimental commanders, so as to secure an intelligent action and co-operation in whatever might occur. Scouts had returned, indicating no serious obstacles to my march from that to Old Church, directly in rear of and on the overland avenue of communication to New Bridge and vicinity.